"An arrestingly powerful singer-songwriter from Canada who writes great historical and social commentary." 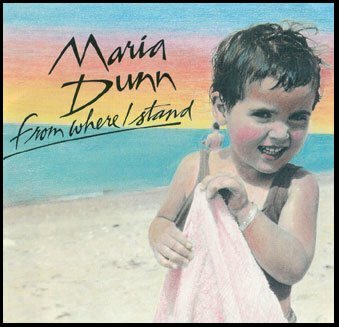 Maria's first CD of original songs is entitled From Where I Stand (1998). Produced by Shannon Johnson, who also produced and performed on Harpe Danse with Terry McDade and on the 1996 Juno-nominated Victory Train with Bill Bourne, the recording features a host of fine Alberta music talent with Maria on lead vocals, accordion and acoustic guitar, Shannon on violin and harmony vocals, Dawn Anderson on harmony vocals, Gary Koliger and Andy Illig on acoustic guitars, Solon McDade on bass, and Jeremiah McDade on whistles. Guest musicians include Craig Korth (Jerusalem Ridge) on banjo and Stewart MacDougall on piano. The songs on From Where I Stand range from the Scottish melody of Shoes of A Man, which tells of her grandfather’s life in Glasgow, and West Mabou Song, which celebrates the musical culture of Cape Breton, to the country and bluegrass feel of Distant Whisper, an upbeat travelling love ballad, and The Fool, a forlorn song of lost love. But no matter what the style, the stories and characters ring true. Every aspect of Dunn's From Where I Stand is powerful and impressive. ...her reflective and poignant historical pieces--Shoes Of A Man, New York 1849 and Orphan Hand--deserve immortality ...Stan Rogers would have certainly approved. Superb storytelling will reel you in...Maria displays her ability to write both melancholic & uplifting songs, perfectly narrated by her clear, unique voice.